Since becoming a mom, I’ve run away from home on a regular basis to recharge at retreats, art workshops and gatherings with friends. These regular time-outs have been critical to my well-being. Tacoma mom Liz Lamoreux agrees that moms need time away to nurture themselves and renew interests and friendships. A teacher and the author of “Inner Excavation: Explore Your Self Through Photography, Poetry and Mixed Media,” she runs creative retreats for women. Check her website for upcoming options. “When moms take time to really listen to what they need and nurture themselves like they nurture their loved ones, they can create more space for joy, for connection, and for love in their lives,” she says. Don't wait! If you are ready for your own time-out, here are some great escapes around the Northwest in beautiful locations, including some “do-it-yourself” retreat options. Do you long to learn how to quilt? Or have unfinished sewing or craft projects laying around that you wish you could finish? 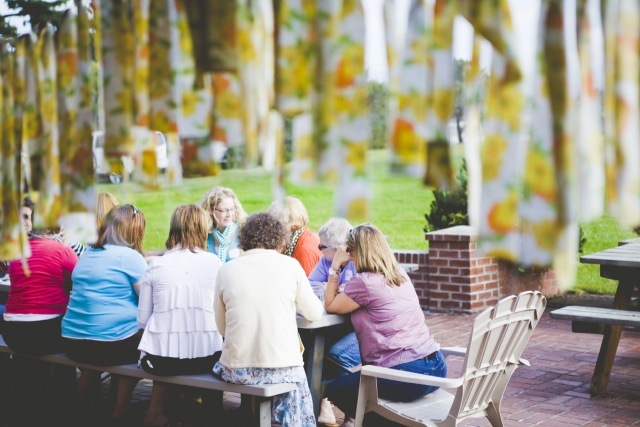 Quilters Dream Retreats offers classes for beginners to advanced quilters at weekend retreats in the spring and fall held at the Salvation Army’s Camp Arnold in beautiful Eatonville. Several quilt and craft retreats are also offered at the YMCA’s Camp Orkila on Orcas Island, typically in winter. Campers bring their own projects and work on them while enjoying stunning views of the Salish Sea. Camp Huston in Gold Bar, adjacent to beautiful Wallace Falls State Park, offers a spring quilting retreat and a fall scrapbooking retreat. At each one participants bring their projects and work in community. All meals and lodging are included. Do you love being out on the water? Check out the kayak trips offered by Friday Harbor’s Outdoor Odysseys, including its Women on the Water tour, starting at $649 per person for a three-day sea kayak trip around the San Juan Islands. Prefer land-based thrills? Check out the spring and fall Women’s Wellness Weekends offered at the YMCA’s Camp Orkila and Camp Colman. Activities include fitness and yoga classes, biking, belly dancing and a zipline at Camp Orkila. Or enjoy backcountry skiing in Leavenworth. Stay at luxurious Sleeping Lady Mountain Resort with instruction by the Northwest Mountain School at the Powder Betty: Women’s Backcountry Ski Camp. Is yoga your ticket to calm? Discover Yoga in Redmond offers occasional yoga retreats at getaway locations such as Whidbey Island. Yoga retreats are offered throughout the year at the Skalitude Retreat and Education center in Carlton, Wash., in the beautiful Methow Valley. Sleeping Lady Mountain Resort in Leavenworth also hosts yoga retreats throughout the year, including one offered by Seattle mom Jen Keeler of Yoga Momma. Learn a new skill at the stunning and historic Fort Worden State Park in Port Townsend on the Olympic Peninsula. (Fun fact: Fort Worden was the site of the movie “An Officer and a Gentleman.”) Learn how to use hand and power tools to make beautiful things out of wood at a Woodworking for Women workshop from the Port Townsend School of Woodworking, located at the fort. Or enjoy a workshop with the Centrum Foundation, also located at Fort Worden, on a wide variety of topics from ukulele, to singing to a summer writers' retreat. Were you a Girl Scout or loved summer camp? Girl Scouts of Western Washington lets women re-live summer days of their youth. Glamp is a magical camp experience for grown-up campers held at Camp River Ranch in Carnation every September. Campers can choose from a variety of fun activities, ranging from making jam, hiking, arts and crafts, yoga or kayaking in the camp’s lake. Add upgrades for an additional cost, including fluffy “princess bedding” and a massage or a horseback ride. Registration for the fall Glamp session typically opens in spring. Not excited by learning a new skill and just want to recharge by hanging out with some of your close friends? Create a do-it-yourself mom retreat. I spend a weekend each year with old friends who are also moms in a rented house or a couple of larger hotel suites. We cook for each other, watch our favorite movies, play board games, hike, shop and swap our favorite books. There are lots of options for small groups of friends who want to hang out together. You can rent a charming officer’s house at Fort Worden, rent a house on or near the beach in Cannon Beach on the Oregon coast through Beachcomber Vacation Homes, or stay near Mount Rainier at Copper Creek Lodge, which sleeps up to 12 guests. Or rent a house at Suncadia, where you and your friends can schedule some pampering at the resort’s spa and enjoy the fitness center and indoor pool. For a super-affordable retreat for yourself, ask friends with a great house or cabin to consider you for their next house-sitting gig. If you are determined to find time for yourself, there is a way to make it happen. Book exchange. Each mom brings a few books she loved and has finished reading to exchange for some new ones. Power card crafting. Bring a pack of blank cards and envelopes and your art supplies and work on a batch of handmade birthday or holiday cards. Yarn bomb. Bring your current knitting project. Film festival. Each friend brings her favorite DVD with themed snack to share. Board games. Bring your favorite board game to play together. Interview each other. Everyone brings one question for the list — i.e. what is your favorite childhood memory? Capture each session on video if you like. Take an online art class. Many artists, including Carla Sonheim, author of “Drawing Lab," and Dawn DeVries Sokol, author of “A World of Artist Journal Pages,” offer excellent online classes you can take from anywhere with internet access. Enjoy an outdoor adventure together. Plan a hike or rent some kayaks or bikes. Share a skill. Each friend brings a new skill to share that the group will enjoy learning. Anything from to how to fix a flat on your bike to how to make pie crust. Editor's note: This article was originally published a few years ago and updated most recently in January 2019.